UCLA fired its coach after a slow start to the season that included a loss to Ohio State in December. We’ve welcomed the new year, the holiday decorations have been put away and now we can devote our complete attention to college basketball and the full dive into conference play. Before that happens, however, let’s review some of the surprising and disappointing teams of the first two months of the 2018-19 season. Ohio State: The Buckeyes (12-1) were expected to be, at best, a rebuilding, middle-of-the-pack team in the Big Ten after returning just two starters and six scholarship players. But they matured quickly and have risen to a No. 14 ranking this week. A pair of freshmen, guards Luther Muhammad and Duane Washington Jr., have fit into a seven-man rotation where every player averages at least 7.4 points per game. Sophomore center Kaleb Wesson leads the team with averages of 16.5 points and 6.8 rebounds. Houston: The Cougars (14-0) were expected to challenge for the regular-season title in the AAC but few believed they would enter the new year undefeated and ranked 19th. Victories over Oregon and Louisiana State started to make people notice them, as did a home-court win streak that has reached 27, longest in the nation. Houston is doing it with defense – 57.9 points per game allowed, and percentage defenses of 35.4 overall and 25.9 from three-point range. North Carolina State: Coach Kevin Keatts returned only three players from last year’s team that unexpectedly won 21 games and advanced to the NCAA tournament. But he rebuilt quickly, and a 78-71 win last month over then-No. 7 Auburn thrust the Wolfpack into the national spotlight. 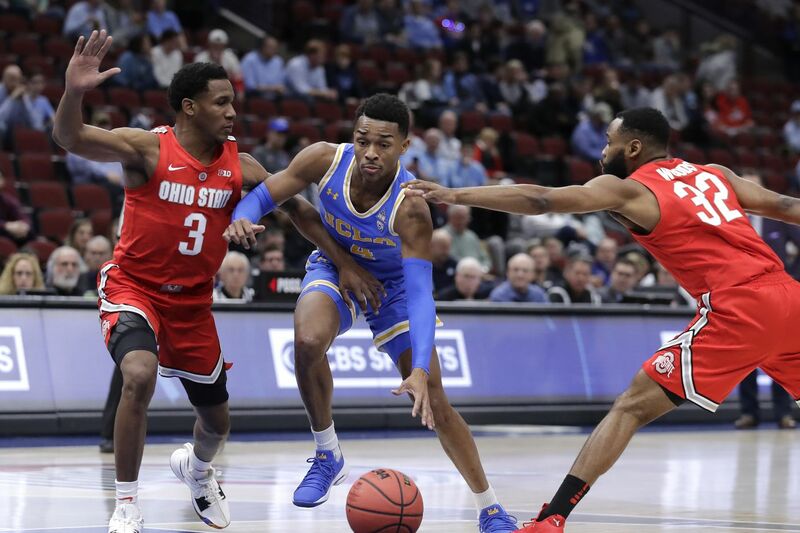 North Carolina State, which began this week ranked 18th, is led by two holdovers – guards Torin Dorn (15.1 points per game, 6.5 rebounds per game) and Markell Johnson (11.8 points, 4.2 assists per game). Michigan (sort of): The Wolverines were one of the final two teams left standing in the 2018 NCAA tournament so their preseason ranking of 17 was no surprise. But they have not faltered yet this season, rising to No. 2 behind Duke. They posted a 27-point win over Villanova on the Main Line and defeated North Carolina and Purdue. Forward Ignas Brazdeikis (16.5 points per game, 5.1 rebounds per game) is making his case for Big Ten freshman of the year. UCLA: A four-game losing streak where the average margin of defeat was 15 points, including upsets by Belmont and Liberty, proved to be the undoing of head coach Steve Alford, who was fired last Monday. In his 5 1/2 years in Westwood, Alford led the team to three NCAA Sweet 16 berths and produced three top-five recruiting classes, but he was subject to constant criticism from a fan base that found him to be aloof. Under interim head coach Murry Bartow, the Bruins (8-6) opened Pac-12 play Thursday night with a 92-70 home win over Stanford. Could their worst days be behind them? Kansas State: The Wildcats (10-3), who began the season ranked No. 12, have put up some decent defensive numbers. But they aren’t shooting (42.7 percent from the field, 31.5 percent on threes, 62.4 percent from the line), and they aren’t scoring (a Big 12-low 65.8 points per game). They put up only 47 in a 20-point loss Wednesday to Texas. Star forward Dean Wade (13.6 points per game, 7.8 rebounds per game) is out with a foot injury. Villanova (sort of): This is more in line with what the national pundits believed at the start of the season, that the Wildcats would barely skip a beat even after losing four players from last year’s national championship team to the NBA. But Jay Wright warned that his team’s No. 9 preseason ranking was too high, that it would take time for the team to reach the level needed to compete once the Big East season began. Surely no one anticipated a shocking home loss to Furman along the way but it’s a young team trying to learn how to play the Villanova way. Patience is required. Tommy Funk, a graduate of Archbishop Wood High School, is the floor leader at Army. A 6-foot junior, Funk leads the Black Knights in assists with 6.2 per game, ranking him in the top 20 in the nation. He also averages 11.2 points (second on the team) and 3.4 rebounds. Funk also averages a team-high 31.5 minutes for Army. Michigan State at Ohio State, Saturday at noon (Fox29): The eighth-ranked Spartans, the consensus preseason pick to capture the Big Ten title, enter with a seven-game winning streak. The No. 14 Buckeyes have been surprising in the early going but encounter a big test at home. Florida State at Virginia, Saturday at 3 p.m. (ESPN2): The Cavaliers are leading the nation in scoring defense (51.4 points per game) yet again but one interesting aspect of this game is that the Seminoles force an average of 17.5 turnovers while Virginia turns it over just 8.6 times per game. Kansas at Iowa State, Saturday at 5 p.m. (ESPN2): The fifth-ranked Jayhawks’ road to an incredible 15th consecutive Big 12 championship must manage several potholes, one of which comes at Hilton Coliseum. The Cyclones are 22-8 in their last 30 home games against ranked teams. Indiana at Michigan, Sunday at 4:30 p.m. (CBS3): The second-ranked Wolverines’ only loss in their last 29 games came in the national championship contest against Villanova. The Hoosiers’ Romeo Langford averages a team-high 17.5 points per game, best in the Big Ten among freshmen. North Carolina at North Carolina State, Wednesday at 9 p.m. (ESPN): This has all the makings of a shootout between the teams that entered the weekend ranked second (Tar Heels, 90.3 points per game) and third (Wolfpack, 89.4) in the ACC in scoring. Shamorie Ponds, St. John’s, G, 6-1, 180, Jr., Brooklyn, N.Y.
Ponds, whom Big East coaches voted as conference preseason player of the year, has been the spark to the Red Storm’s 13-1 start. He enters the weekend leading the league in assists (6.0 per game) and steals (2.6 per game) and is fourth in scoring (average of 19.2 points). Ponds has three games of more than 30 points this season with a high of 37 against Georgia Tech. He also has four games of between 20 and 29 points, including a 26-point outing in Tuesday’s 89-69 win over No. 16 Marquette.